US President Donald Trump identified his nuclear talks with North Korea as among his greatest achievements in the first half of his first term, amid hopes for substantial results from the second summit between Pyongyang and Washington next month. In the “historic results of President Donald Trump’s first two years in office,” issued by the White House on Sunday, the US administration said he brought the beginning of peace and denuclearization to the Korean Peninsula by holding a historic summit with North Korean leader Kim Jong-un, referring to their meeting in Singapore last June. “Since the summit, the leaders have exchanged letters and high-level officials from both countries have met. Because of the President’s actions, North Korea has halted nuclear and missile tests,” the White House said in the release. On the same day, Trump said on Twitter that he is “looking forward to meeting with Chairman Kim at end of February.” The US government said Friday that Trump and the North Korean leader will meet late next month at a location to be announced later, following a meeting between the US president and North Korea’s lead nuclear negotiator Kim Yong-chol. “Because of his (Trump) strong stance and because of his engagement with Kim Jong-un directly at that first summit in Singapore, (there has been) no testing of nuclear weapons, no firing of missiles,” he said in an interview with Fox News on Sunday. North Korea’s Vice Minister of Foreign Affairs Choe Son-hui and the US special representative for North Korea, Stephen Biegun, are holding talks, which began Saturday, in Stockholm, Sweden, to discuss what kind of steps North Korea will offer to shed its nuclear weapons, and incentives that US will provide in return. Their negotiations are expected to continue through Tuesday. “A freeze of North Korea’s nuclear weapons program is an agreement that they should reach this time,” said Hong Hyun-ik, chief researcher at the Sejong Institute. “It will help Trump save face if the North says it will permanently destruct the Yongbyon facilities and verify it with inspection. But it all depends on what the US will give,” he said. Hong said the easiest option that the US can offer will be the establishment of a communication channel between North Korea and the US. 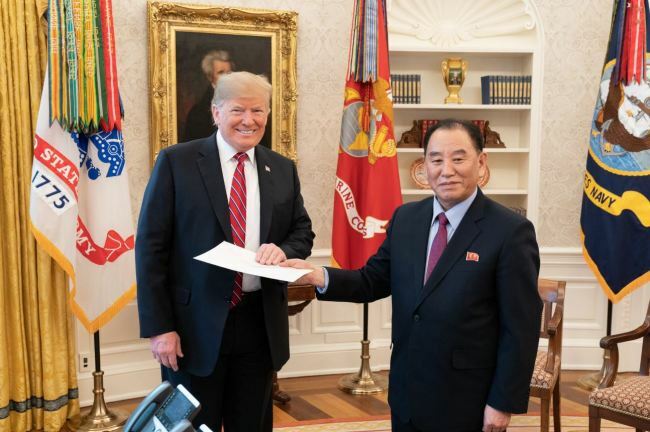 A declaration ending the Korean War is also a possible bargaining chip if Pyongyang provides assurance that this would not affect relations between the South and the US as well as US troops in South Korea. In addition, a pledge to cooperate with the United Nations for sanctions exemption for the reopening of the joint industrial park in the North’s border town of Kaesong and resumption of a suspended tourism program to Kumgangsan could be included, he said. “Denuclearization should be carried out in phases. It cannot go from zero to 10 at once. North Korea is a regime. It has the right of self-defense to pursue mutual trust in the international community,” he said.